Welcome to Bouncing Buddies. If you're looking for inflatable fun jumps in Lafayette, LA, you've come to the right place! We have a HUGE selection of inflatable fun jumps and inflatable water slides for rent in Lafayette. People choose to rent inflatable fun jumps from Bouncing Buddies for many different reasons. Whether you're celebrating a birthday party, graduation party, school festival, church event, or even a major corporate events, inflatable fun jumps are the perfect solution! Your guests will enjoy hours of jumping fun on one of Bouncing Buddies many inflatable fun jumps. We literally have TONS of officially licensed fun jumps to choose from. 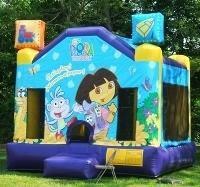 Whether you're looking for a Batman fun jump, or a Dora The Explorer fun jump, we have them all! People have been renting inflatable fun jumps and inflatable water slides from Bouncing Buddies for years because we're committed to providing the best service around. We have staff that is trained to take care of all your jumping needs! Of course, we also rent tons of inflatable water slides and other great party rentals too!!! So, if you're looking for inflatable fun jump rentals in Lafayette...look no further than Bouncing Buddies!